The RCC Course d’Equipe is an exciting and unique ride that invites teams of riders to work together on challenging courses set in Washington State. Above all, the experience of the ride is the spirit of Course d’Equipe: the experience of riding with a team and the experience of cycling on some of the most beautiful and challenging routes that Washington has to offer. You’ll ride through small communities and on a variety of surfaces. The course you follow is ultimately up to you but you will be required to make every checkpoint along the course. While you'll know the suggested course before event day, you’ll learn about the the checkpoints at the start line. You’ll register your team's progress at checkpoints using the tiny technical marvel that is the smartphone as teams will check in by snapping team photos at checkpoints along the route. Teams must work, play and stay together throughout the entire event. Course d’Equipe 2019 will start and finish on the Capitol Campus in Washington's State Capital of Olympia. The orderly buildings and landscaping of the Capital will quickly give way to views of water, mountains and Washington countryside. 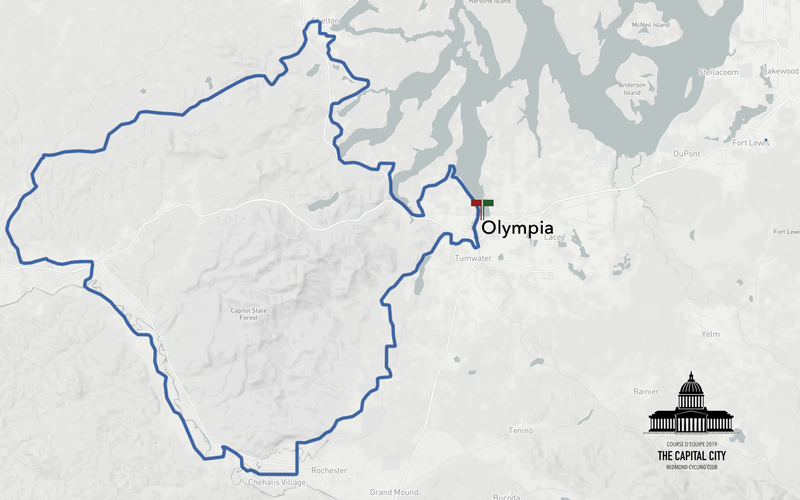 Over the next 8-12 hours, you’ll explore new routes and visit smaller government buildings in the communities surrounding Olympia. There will be room for a maximum of 40 teams each comprised of up to four bikes. A team may consist of up to 4 bikes in any combination of single or tandem bikes. Every team is required to have and register a team name so that the world will know how to speak of you and your achievement for years to come. If your team has only 2 or 3 cyclists, you can still form a team. If your team registered with 3 or 4 riders but one or two can no longer make the ride on event day, you can still ride Course d'Equipe with a minimum of two riders (or team up with another team to form a 2-4 rider group). If you'd like to ride but need to join a team - or if you have room on your team for one or two riders, you can contact the ride Directors via mail at and they'll help you find a team or rider. The entry fee for each team is $25 per rider with an additional $25 required for every second tandem rider. The entry fee for a team of 4 singles is $100. The entry fee for a team of 4 tandems is $200. Your team entry fee covers rider t-shirts, ride awards and post-ride celebration food and drinks. You can register online using the button at the top of this page. Note: registrants after May 24th may not receive an event t-shirt due to time required to produce ahead of the event. Course d'Equipe's route is defined roads and checkpoints that must be attained and often the best path might be the route that is provided. The route might involve a converted rail trail but perhaps the quickest route is for fit teams to take on a segment of rollers - ultimately it's up to you. After you've completed the course, hang out with the other teams and friends to share stories and photos about your experience. We'll have food and drinks set up in the park. The Post Ride Celebration will be open from 4-7PM. We're handing out awards for categories that inspire us about the course and teams that day. Course d'Equipe awards celebrate Washington State and feature wines from the region that we're cycling through that day. Awards will be handed out for Quickest Team, Most Stylish, Most Experienced Team, Least Experienced Team and Dead Last. Pace: Up to you and your team! Ride Goal: Stay together, ride safe, earn a bottle of wine and have fun! Every Course d'Equipe provides a suggested route to use to visit all checkpoints and complete the ride. The suggested route will guarantee successful navigation but it does not have to be followed exactly. Local knowledge and thinking could lead to alternative segments on the route that could save your team a few minutes and give you a slight advantage. As we get closer to the event, we'll release more information about the route. There will be no support staff or SAG vehicles out on the course. When it comes to eating, you'll need to make decisions. Should you fuel up while riding your bike or grab a bite in a town - it's totally up to you and your team! Like any good weekend ride, you'll be on your own with your teammates to solve any mechanical, nutrition or otherwise issues to complete the ride, stay safe and ultimately get back home. The Course d'Equipe course designer is Ride Director Per Sunde who is local cycling ride leader with decades of experience designing and leading cycling routes. Per enjoys crafting routes that are challenging, interesting and make you go up a steep hill or two. Course d'Equipe is an RCC Club ride. You must be an RCC Member to take part in Course d'Equipe. RCC Membership allows us to keep insurance costs at a minimum and lower the overall cost for the event. If you're not yet an RCC Member - it's easy to sign up today for the price of two tubes: click here to join RCC. The Ride Director will verify all riders at the course start.